Remember the song Stuck In The Middle With You and the line about "clowns to the left of me, jokers to the right"? That's a pretty good description of the internet. When you spend as much time online as we do it's hard to believe that the internet isn't entirely populated by loons, goons, spammers, scammers and people who shouldn't be given crayons, let alone an internet connection. 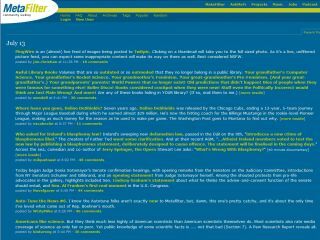 MetaFilter is ten today. That means it's spent ten years being our happy place, the site we go to when the sheer idiocy of most of the online world gets us down. As I write this, the front page topics include terrible library books, Ireland's new blasphemy law, various important political stories, some daft Flash stuff and proof that cats really are messing with us. What makes MetaFilter really special, though, is the discussions - the comments on posts, and the free-for-all conversations on Ask MetaFilter. Where other sites often revolve around people spouting off about things they barely understand, MeFi discussions tend to be much better informed. That's partly because the kind of people who hang around MeFi aren't post-first think-later blowhards, and it's partly because MeFites appear to have infiltrated everything interesting on the planet. If the thread's about newspaper scandals, you'll find newspaper people sharing their insight. Science? Scientists. Bad sound on CDs? Professional sound engineers. Religion? We're pretty sure that God's been a member for years. As founder Matt Haughey writes in the site guidelines, "I trust that you'll act in a civilized manner, that you'll treat others with opposing viewpoints with absolute respect and that you'll contribute in a positive way to the intelligent discussions that take place here every day." On any other website, people would read that bit, ignore it and start pimping products or throwing verbal rocks at the other members. On MetaFilter, people try to live up to it - and they've been doing it for a decade. That means MetaFilter isn't just a website: it's a miracle.